This Asparagus Risotto Recipe feeds two. The beauty is you can substitute any veg throughout the year. In spring you can use peas, broad beans or both. 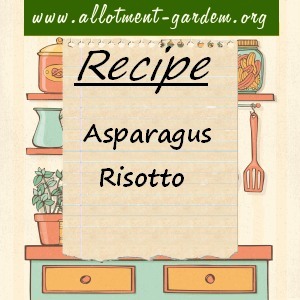 A basic risotto is a great vehicle for very many vegetables. If you are unsure, a risotto should be runny, not dry, like a rice pudding only savoury. Cook onion in the butter and olive oil without colouring it. Add the rice and coat with the butter and oil. Add wine and simmer until almost evaporated. Add half of the herbs and lemon zest to taste. Now it may sound laborious but you need to stir in the stock a ladleful at a time until the rice is cooked. When cooked, add the asparagus, parmesan, herbs and an extra knob of butter. Remember, this is something you eat occasionally so make it properly and don’t skimp.